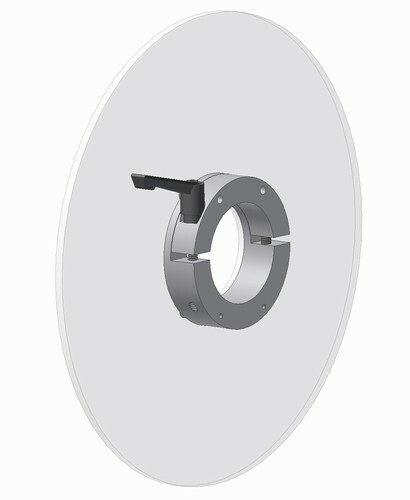 Outer Diameter (D)*: 4" 5" 6" 7" 8" 9" 10" 11" 12" 13" 14" 15" 16" 17" 18" 19" 20" 21" 22" 23" 24"
Clamps to the outer diameter of a core chuck or shaft. It will prevent the web from wandering and telescoping. Easily removed or positioned with a turn of the handle. As shown, can be infinitely positioned on non-expanding / non-gripping area. Optionally, bore can be relieved to accomodate lugs, buttons, grippers etc. Contact factory with details. Aluminum offers superior strength and rigidity. Lexan allows operator to see thru to monitor web.